The World's Smartest Smoke Detector? False smoke alarms kill. When 'traditional' smoke alarms are tripped by false sources like steam or weather changed, many people resort to disabling them to prevent annoyance. Thanks to a new type of sensor, a manufacturer claims it is producing a 'smarter' detector that overcomes traditional weaknessess and alarms on more than just smoke. In this note, we examine USI's IoPhic Sensor, investigate the 'difference' in sensor technology, and compare the cost against traditional models. World's quickest response to flaming alarms AND smoldering fires. Unit detects and alarms on CO and Natural Gas leaks. Unlike traditional sensors, IoPhic uses an adpative 'learning mode' program via onboard microprocessor to recalibrate and adjust alarm thresholds over time. Where other sensors can be 'tuned' to a certain location after install, they do not have the ability to adapt to environmental changes over time. Ion sensors are especially adept at detecting 'smoldering' fires that may not generate much flame, heat, and smoke. 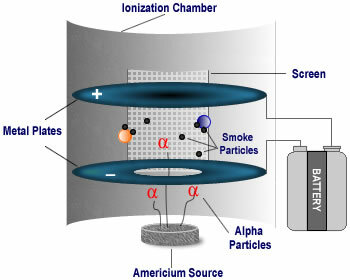 Even slightly smoke-laden air is detected by the sensor. However, due to the extreme sensitivity of these sensors, they are often prone to false alarming due to non-smoke related changes in the surrounding air. Given the addition of IoPhic's microprocessor and real-time signal filtering of the 'ion sensor', the alarm threshold adjusts over time and makes it less prone to 'false alarms'. In addition to smoke detection, the unit will detect high ratios of carbon monoxide and natural gas in a building. Unlike the smoke threshold, the CO alarm threshold is fixed at a certain rate and Natural Gas leaks are detected as a change in concentration over time. While these additional alarm sensors are commonly available, they are not commonly integrated into the same unit as the smoke alarm. Combining everything in one unit lowers total installation costs. Unlike other ion smoke alarms, the IoPhic notifies when the sensor hits the end of its service life. Because the ion sensor is dependent on a radioactive component, the sensitivity declines over time as the sample decays. While other sensors recommend being changed at 7 - 10 year intervals, they do not keep track of the service life. Unfortunately, a 'bad' sensor looks the same as a 'good' sensor, and the service life must be manually tracked. IoPhic begins a timer after initially powered up, and will send an unclearable 'beep' at 30 second intervals once the service life has expired. IoPhic is networkable to (up to 24) other IoPhic sensors, so that a 'mesh' of coverage can be created. If one sensor alarms, the rest of the alarms will simultaneously sound. This is useful in 'stand alone' residential fire/smoke detection systems that are composed of panel-less detection and notification. However, the IoPhic is not 'out of box' addressible by commercial fire alarm panels. Unless the respective fire alarm vendor manufactures a 'universal addressing module', integrating IoPhic with commerical systems is not possible. IoPhic is more expensive than most other 'ion' alarms. Many community outreach/public safety programs simply give away smoke detectors. If free units are not available, most units can be purchased at home improvement stores/online for under $10 each. By comparison, the price of the IoPhic is sharply more expensive at $79 online. However, given that a single IoPhic replaces up to two additional units (CO and Natural Gas), the extra cost is offset in reduced sensors to buy, install, and maintain. In addition, IoPhic is a good fit for environments where the temperature swings and humidity shifts can bring about false alarms from traditional sensors. Other applications, like commercial kitchens or dusty storage area will benefit from the adaptive ion sensor that rules out errant readings.